Europe is a year-round travel destination, and because we are a little bit obsessed with traveling, we believe that anytime is the best time to visit it! Even so, the most pleasant time for traveling in Europe starts from May to July and continues throughout September. So does this mean you have to skip fall and winter? Not at all, every season has its distinct charm, so it really all depends on where you're planning to go, how well you're prepared for the trip, and whether the season you choose actually fits your vacation expectations. Read our guide to learn all about the so-called "peak-season" and "off-season" to see which timing best matches you and your vacation preferences. Why travel to Europe in peak-season? "If sun, warm weather, activities & beaches is the name of the game ..."
A "peak-season", or high-season, in Europe roughly ranges from late May until July, and in some destinations also continues from September till October. The time from late April until June and from September through October is also called "shoulder-season". Our long-time experience in the travel industry dictates that Europe is at its enchanting best in summer, spring, and early fall. And how couldn't it be? When traveling in the peak-season you can be almost certain to get sunny weather, warm water, and of course, you have longer light days, which translates into more time for touring the cities, visiting museums, and restaurants. it is a truly magnificent natural wonders show, greener than at any other time of the year, and the most suitable to discover the most beautiful sceneries, the artifacts of human culture, national parks, and forests. The peak-season is also the best time for family vacations, since kids don’t have classes anymore, and parents can easily find a suitable date for all members of the family. Our overseas travelers from the United States and Australia prefer this time of the year also because airlines release more flights, and it is more convenient to arrange longer or multi-city tours. When many people set out for vacation, prices skyrocket, reservations become scarce and tours are quickly sold out. Last-minute planning for high-season vacations is hardly possible. Planning for peak-season can be a bit more stressful since you are trying to "catch" the suitable dates, reasonable prices, rooms with nice views, and tours with the best experiences. Some travelers simply want to avoid this hassle and choose to select off-season dates. What to expect from peak-season tours with Firebird? We always have a number of 4-5-star downtown hotels reserved in advance for our peak-season travelers, that’s why our clients get the best accommodation and don’t need to choose from only what's left. We also have our local guides ready to visit the main sights together with our small groups or private travelers. The hotels we select are always centrally located and we arrange private drivers for day tours and hotel transfers. All of this ensures that our travelers can start their touring early in the morning, avoid heavy tourist crowds and excruciating hot temperatures, as well as save a lot of time for qualitative no-rush sightseeing. Because of downtown accommodation and carefully-planned sharp logistics, our travelers can spend their evenings wandering the streets of vibrant cities and having dinners at various local cafes and restaurants, instead of simply resting at boutique hotels located on the outskirts from which transportation to the center is often complicated or very expensive. Italy, Spain, Portugal, Morocco, France, Russia, Scandinavia - are the destinations loved for their warm weather, a promise of sun, and culinary experiences. So it is no surprise that from May till July, and September, we have many travelers and adventurers there. It is still worth going to these destinations in peak-season despite the higher number of tourists because let’s admit it, there's a valid reason why so many travelers come to Europe specifically at that time of the year - it is undeniably breathtaking and gorgeous, from nature and city colors to multiple cultural sights. Scandinavia, Russia, Baltics, Britain is where the best weather and longest days are possible, and where the big crowds of other destinations are rare even during peak-season months. See all Firebird tours by season: Summer tours, Spring tours, Fall tours. What's our advice for peak-season travelers? We highly advise booking all services in advance, the more you wait, the fewer choices for available tours and accommodation you get. Read more why to book in advance. If you want to lock in your trip for less, search for companies that plan tours 1 year in advance & offer early bird deals. We don’t advise taking a bus tour during a peak-season - you'll have less comfort, will have to rush through the sights and points of interest, and often stay in hotels so far from the city center, that you'll have to waste from 2 to 3 hours of your precious vacation time just to commute back and forth every day. When you travel overseas, consider having more quality time exploring the destination. Top attractions are usually crowded with tourists in the peak-season. Make sure you or your tour operator arrange your sightseeing tours as early as possible to avoid long lines. Provided the chance, choose centrally located hotels for your stay. This will also help you to reach the sights early in the morning and give you more freedom to explore in your leisure time. If possible, get a private driver. It saves a lot of time and you can get anywhere you need before the big crowd of tourists. Expect high temperatures, so pack your clothes wisely. Plus, don't forget your comfortable walking shoes. July is one of the rainiest months in some European countries (France, United Kingdom, Germany, Switzerland), so just in case, pack an umbrella and a light jacket if traveling in July. Choose few days for the local experience, and allow some time to enjoy smaller delights like various gourmet tours and unbeaten paths. Why travel to Europe in off-season? "If season colors, tranquility, culture & saving money is the name of the game ..."
The so-called "off-season" is not the same for all destinations around the globe, but in Europe, it usually starts from late October and continues through November, March, and the beginning of April. We have built more than 70 thousand itineraries to Europe and beyond in the last few years, and what we noticed is that during the so-called off-season, and especially in March and April, locals are often more receptive to your requests - so you can not only get more suitable prices but also upgrades & special offers. The off-season grants benefits like thinner tourist crowds, better tour and airfare prices, quieter and cheaper hotels. Moreover, last minute planning is almost always possible for off-season travel. This is the time when the traveler can enjoy a spectrum of harvest-season or spring-blooming colors. Traveling in October you will find the weather still warm in most of Europe, and water in some countries like Portugal may even be warmer than during the summer months. Travelers also plan their tours from September to April if they dream of witnessing the famous Northern Lights since it is the very best time to do it. Starting from September the days get shorter and thus you get less time to explore your destination. You will need to spend more time planning as some smaller cities may have no attractions or accommodation for the off-season. Nevertheless, some cities are still vibrant but much quieter, and still have pleasant weather, less traffic, often still green landscapes. Some countries get colder than others during off-season, so you need to be aware when choosing your destination. What to expect from off-season tours with Firebird? Our 10+ year experience shows that over the years off-season, and especially fall vacations, have become more and more popular, and for a reason. 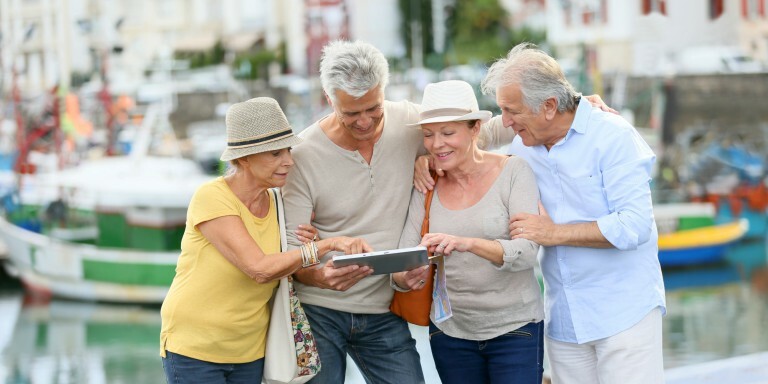 Most travelers are 40+, 50+, 70+, so often their schedule is not limited to only the summer, and they want to brighten their fall and even winter with a nice vacation to Europe. Why? Because it is less crowded, the colors are amazing in fall, and the weather is often more pleasant then what they have back at home. Winter in some destinations offers unforgettable winter activities like husky dog sledding or visiting Santa's village. And one of the main reasons why off-season tours are perfect when planned by our destination specialists is that we arrange everything from airport transfers and comfortable hotels to private drivers and multiple guided tours with local professionals. What does this mean for our travelers? Correct, a no-worry, well-arranged, simply better tour with top destinations and sights included. Italy, Spain, Portugal, and France are some of the most famous destinations for off-season travel, especially for April and March. The fall is perfect for Morocco and Britain, welcoming tourists all year round and offering many cultural activities. For those considering colder months like November - December, we suggest visiting Lapland, Switzerland, or& Scandinavia to enjoy the full spector of winter fun from snowmobile rides and visiting indegenious Sami people to Northern Lights seeking. See all Firebird tours by season: Fall tours, Winter tours. What's our advice for off-season travelers? Since days get shorter, you will have less time to visit sights, it means you need great logistics. Do your research on which sights are still open for visitors, carefully check all necessary transport timetables, and make sure to call ahead of time to confirm that your attraction (e.g. museum) is open. You will find that some sights close during the off-season, consider going to bigger cities or get a local guide or a travel company that works with local professionals. Plan your trip around a special event or celebration in your destination. Celebrate with the country and get a glimpse of real traditions and local life. If you don’t mind frosty temperatures, consider going even in winter months, which can mean incredible discounts and quiet attractions. Note that 1-3 weeks leading up to and following Christmas can sometimes feel like high season in many parts of Europe. Countries famous for skiing won't have price drops during winter months, you can also expect crowds. You can encounter harder weather conditions, so pack your bags carefully - there is no such thing as bad weather only bad clothing, right? Traveling to Europe is such an adventure, go for it any time of the year! Browse our select tours to Europe and plan a journey to remember for a lifetime.